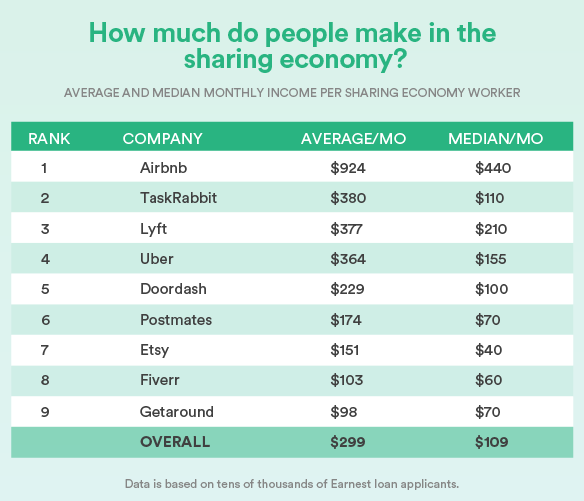 How Much Are People Making from the Sharing Economy? This post is adapted from the blog of Earnest, a Priceonomics Data Studio customer. Does your company have interesting data? Become a Priceonomics customer. 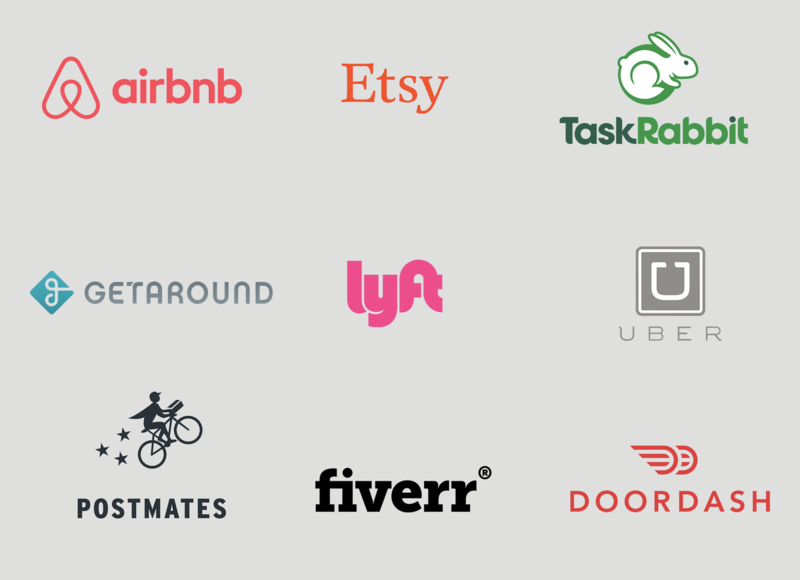 Coined shortly after the financial crisis in 2009, the so-called “gig economy” or “sharing economy” refers to the growing cadre of companies like Airbnb, Lyft, and TaskRabbit—platforms that employ temporary workers who provide a wide variety of services: delivery, ridesharing, rentals, and odd jobs. A recent Pew study estimated that nearly a quarter of all Americans earn some money through these platforms. 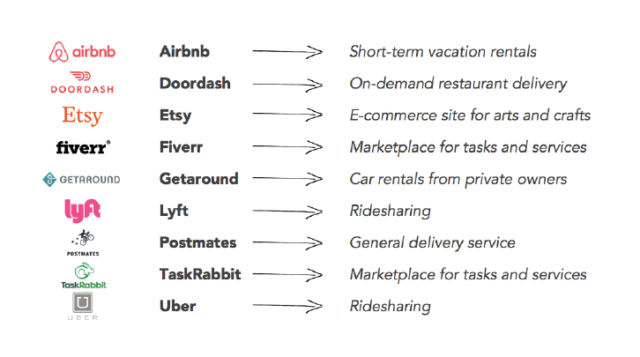 But how much money are the service providers in the sharing economy actually making from their "side-gigs"? 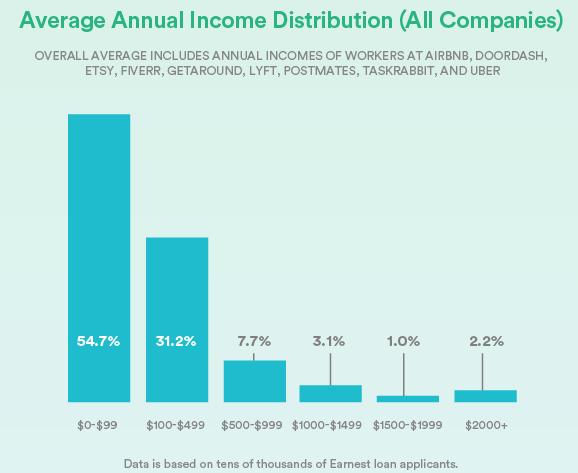 We analyzed anonymized data from Priceonomics customer Earnest, a loan provider, and examined tens of thousands of loan applicants to see how much people are earning on side-gig platforms and how these platforms stack up against each other. We looked at a span of data accounting for just over two years, and for each worker, we analyzed a pay period of between one and 27 months. We do not know how many hours of work the income represents for each platform, as each one has a unique pricing and commission structure. Furthermore, this data is just reflective of the Earnest user base, who are typically refinancing college loans and therefore may be more likely to be treating these services as a “side-gig” than the typical service provider who may be more likely to treat it as a fulltime job and have different earning levels. We found that 85% of side-gig workers make less than $500 a month. And of all the side-gig platforms we examined, Airbnb hosts earn the most by far. 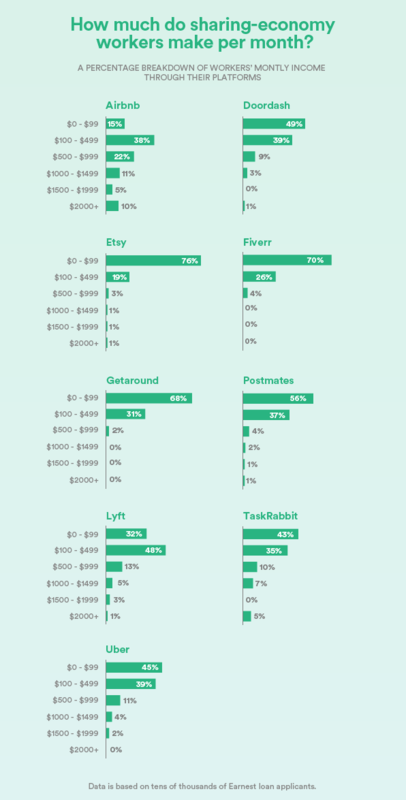 In our data, on all but Lyft and Uber, we excluded any worker who made a total $10 or less from a platform to eliminate data points that could simply represent a refund from the company. For Lyft and Uber, we excluded anyone with a total income of $50 or less. Then we tallied the average monthly incomes made by workers at each company. Of course, on all of these platforms, there is a wide range of earners. Several Airbnb hosts in our records, for instance, made over $10,000 per month, while others made less than $200. To really understand these averages above, we took a deeper look at these ranges. Below, we’ve charted out the income distribution for each company. The figures represent the percentage of workers who fall into each month income bracket. Airbnb hosts enjoy the highest average monthly earnings because there is a much wider range of income distribution on that platform than at other companies: Nearly half of all hosts make more than $500 per month. Conversely, the majority of workers at some other companies (Etsy, Uber, Fiverr) fall into the $100 or under per month bracket. Tallying all of these companies up, the overall distribution tilts strongly toward the lower end. 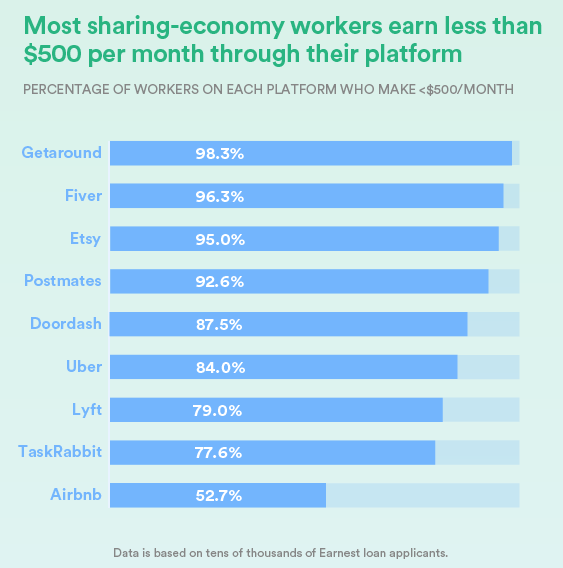 Some 84% of all gig economy workers make less than $500 per month—but in particular, workers at Getaround (98.3% under $500 per month), Fiverr (96.3%), and Etsy (95%) have especially high percentages of low-earners. Reasons for the low income could vary—some workers may be simply trying the platform, or put in very few hours. Lyft, Taskrabbit, and Airbnb seem to beat this “84% under $500” average. It might be easy to look at this data and assume that gig economy workers are working at below market rates. After all, $500 per month is hardly a livable wage. For the industry, the key question is how many of these workers are utilizing these platforms to make a little extra cash as a side-gig versus trying to forage a full-time living.